. :: Tabernacle Pentecostal Church Kristus Kasih - Malang - Information tabernacle equipment: the high priest ::. Garments depicts daily life behavior/conduct. These Priest garment are called Holy Garments (Exodus 28 : 4 ; 29 : 1,41). 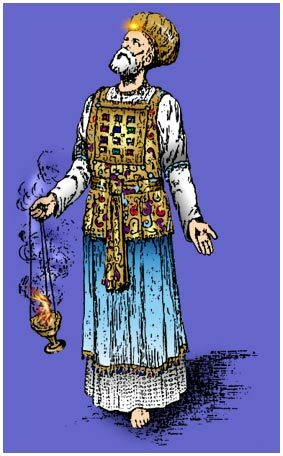 The High Priest’s garment refers to the daily life behavior, which should be holy and sacred like that of Jesus Christ, the High Priest who became a model for the church especially for the priests. This also portrays the conduct/behavior of the pastors as a model for his church members. Priests are they who are redeemed and sanctified by the sacrifice of the Lamb of God (Revelation 1 : 5-6). Ephod refers to the life of Jesus Christ in the sign of the cross in death. This sign can be found in Jesus Christ’s personality. The Girdle has the same colors like that of the Ephod, and unites three kinds of garments: the ephod, the girdle, and the coat (with holes like “ eyes “ ). The life of Jesus Christ is also marked with three signs: Death – Resurrection and Glory. This refers to the resurrection of Jesus Christ. Pomegranates refer to the church /congregation. The gold bells refer to the presence of the High Priest. The presence of the High Priest in the mist of the congregation is shown by the worship in tongues. This refers to the sphere of resurrection. This plate is fastened on the front of the turban with a blue cord. In Rev.7 : 3 ; 14 : 1 ; 22 : 4 ; 3 :12 it is written that the name of the Lord is sealed upon the foreheads of His children. The name of the Lord cannot be separated from His Word or His Personality. Likewise on our hearts and minds should be written His Name (=His Word). The Ephod refers to Jesus death whereas the blue robe refers to risen life, to the resurrection, so this tunic refers to His ascension in glory. This garment can be best described as a garment worn inside with embroideries like many eyes. In Leviticus 16:2-4 ,it is said that the High Priest on the Day of Atonement entered the Most Holy Place not wearing complete set of the High Priest’s garment’s but he wore only the holy linen tunic and the linen trousers because this garment refers to the glory of Jesus Christ when He ascended to heaven. His life in the sign of death (cross) has passed, like the putting off of the ephod. His forty days resurrection on earth has also passed so the blue robe has also been put off. The long sleeved tunic of fine twined linen is a part of the Priest’s garment that is worn inside, so it is like God watching/searching the most inner part of our lives, the hidden secrets of our lives. This is a distinctive and surprising part of the garment because of its particular position. This four square breastplate depicts the New Jerusalem the four square city that is thousand years long near the heart of God and that will come down to the new earth (Rev 21 : 2,9-10). This is the Bride of the Lord who has reached the spiritual level as that of the Bridegroom because the breastplate has the same colors as that of the ephod (=Jesus life ). The twelve stones on the breastplate depict the twelve apostles of the Latter Rain who rule the Latter Rain Church that is the church that will be lifted up in glory. Whereas the twelve names of the sons of Israel engraved on the two onyx stones of the ephod refers to the twelve apostles of the Former Rain. The Urim and the Tummim found on the breastplate are not described in the Bible, what and how the conditions are. There are much interpretation about the Urim and the Tummim, let us just pay attention to the meanings of the two words. The garments of priests consist of tunic; girdle and turban or mitre and these are also garments of glory and honor of beauty (Ex 28 : 40). In Ex 39:27 it is said that the tunic is made of fine twined linen. In Rev 19 : 7-8 the Bride’s garment is also made of fine twined linen that glistens. These are the right and just deeds so the tunic of the priests is the holy lives that show just and right deeds. For the High Priest as well as for the priests should be made white linen trunks to cover their naked flesh (Ex 28 : 42), from the waist down to their thighs. To us as priests, God also gives a spiritual life garment to stop living in all fleshly desires and lusts. Finally this holy priestly garment also determines our consecration or a holy life, which is a condition for a true consecration.